On Superbowl Sunday I visited Calaveras Big Trees State Park to interview photographer Susan Conner. She shoots landscapes that tell the story of a quiet earth that often seems to be waiting for something. That meant lots of layers, and as I drove past drifts of snow on the highway, I was glad for the long underwear, double shirts, down vest, and Sherpa cap. But as we sat at a sunny picnic table, the air was warm, the sun burnt our winter-pale faces. We had to speak loudly to be heard over the sound of running water. I get such a charge out of talking about art with creators, especially when they’re as open and talkative as Susan. As we chatted, we began to strip: first gloves, then the down vest, the jacket, the hat, until in the end we were wearing just jeans and shirts. I don’t know about Susan, but I was wishing I could lose the long underwear. I wanted Susan to take me on a mini photo shoot. I’m deeply interested in how others work. I always wonder, how do they get from point A to point B, C, and beyond. Susan hunts for photographs nearly everyday. Things catch her eye, and she starts shooting. She says sometimes she just knows a photo will be great, and other times she doesn’t see the composition until she gets home and looks at the photo on her computer. We crunched through melting snow as she shot random things: water trickling down a redwood stump, burls in an old tree. On the north side of the forest, the snow, rather than melting, turned to ice at the edge of the big meadow. A boardwalk crisscrossed the fen to protect the delicate ecosystem from trampling human feet; it was covered in slick humps of iced-over snow. “Too dangerous,” Susan said, and we turned back to the sunny side of the meadow. There, sparkling in the touch of the sun, streams and rivulets of snowmelt ran through last year’s curled and matted grass. From this approach the boardwalk was dry, and we ventured over the meadow. Suddenly the air was filled with a swarm of flying bugs. Thousands of glowing wings whirred in clouds; on the ground we saw bazillions of ladybugs. There were so many that the ground appeared to be moving. They climbed anything vertical and clung to sticks and stems. Ladybugs hibernate together in clumps during winter, emerging in the first warm days of spring to eat and mate. “It’s too early,” Susan said, as everyone has said when I tell them this story. They should still be hibernating in February. But ladybugs don’t have calendars, and the sun was telling them to wake up. We laughed and laughed while ladybugs whirred around us. Susan clicked off a dozen or more shots into the air, trying to capture the floating, glowing insects. Then she jumped to the boggy ground and began composing shots of the clumps of the orange and red bugs that had not yet flown. I stood watching, back to the sun, and later Susan had to brush the bugs off my sweater; they had clumped together in the warmth on my back. After our walk in the woods, Susan went off to photograph more ladybugs and I dragged out my easel and paint box. I painted the watercolor at the top of this post, trying to capture the feeling and the colors of the day. 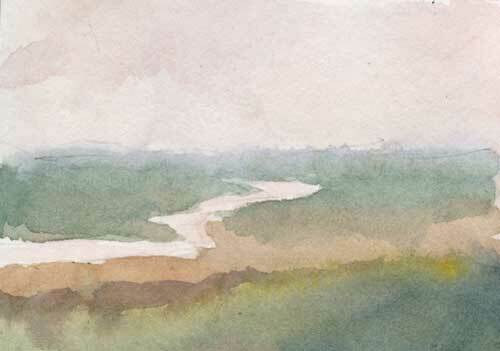 For a landscape photographer, for a landscape painter, for a writer, for anyone who creates, I think the trick to inspiration is simply showing up. You never know what will happen when you step outdoors. You could find icy snow on your favorite path, but if you turn around and go a different direction, you could find yourself in a cloud of flying ladybugs. Near my house the pond had gone perilously dry until our recent rains. But El Niño has come to the rescue and filled it to overflowing. Last night on my walk, I noticed water rushing through the overflow ditch and into a spillway. It was a sweet scene in the afternoon light, with tree frogs singing, and the rays of sun streaking the water beyond. I whipped out my sketchbook to capture the mood with a pencil drawing. 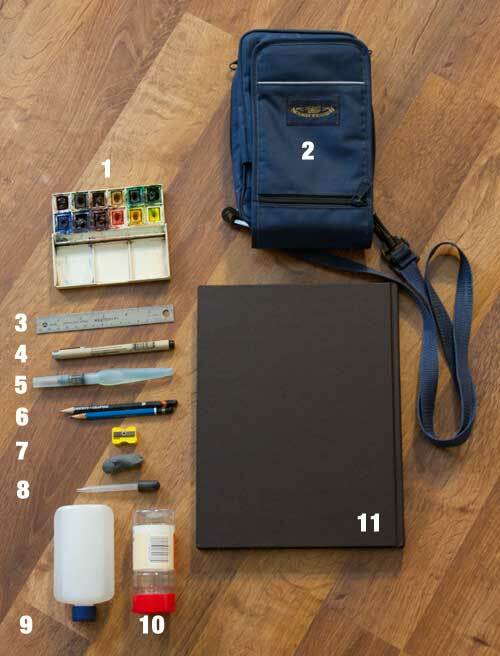 Yes, I always carry a sketchbook and pencil, even on my walks. Doesn’t everyone? My goal for this exercise was to draw enough information so that I could make a painting from it in my studio (where it’s warm and I have hot drinks and a restroom). What information did I try to capture? A rough idea of composition I’ve been working on improving my compositions. 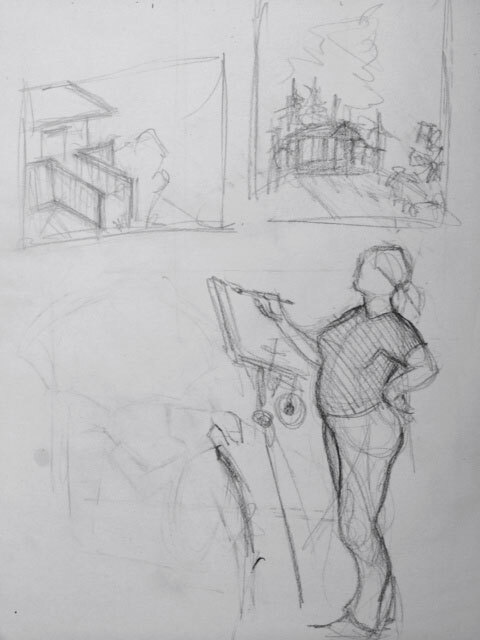 In this sketch I was trying to see big shapes rather than worry about detail. Areas of interest I liked the water line as it went from the organic shape of the ditch to the man-made hard lines of the cement weir. Then there’s that little corner in the left hand side where the water starts that I also found interesting. Relative values of the whole scene There was a simple, stark contrast between water and land, but on the cement weir the values grew trickier. I was also trying to think about how the light and dark values could lead the eye and create the illusion of water. Although this was a quick sketch, it wasn’t quick enough. 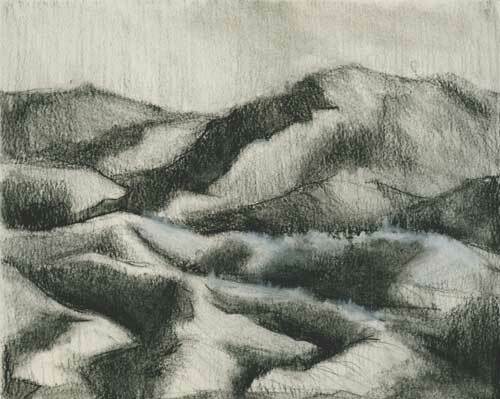 Suddenly it got very dark, and I realized that the sun had sunk behind the ridge. I was still a couple miles from home, night was falling, and mountain lions were about! Clearly I made it home (and I wrestled, not with mountain lions, but with my lazy self as I climbed the hill towards home) and this morning I painted the study at the top of this post, using information I gleaned from my pencil sketch. For me, art is all about learning to see. It’s good practice to make these little black and white studies and try to paint them later. It sharpens observation skills, and hones the memory. Plus, there’s a nice cuppa with milk and honey back at the studio. While the fiddler drives, I like to paint. 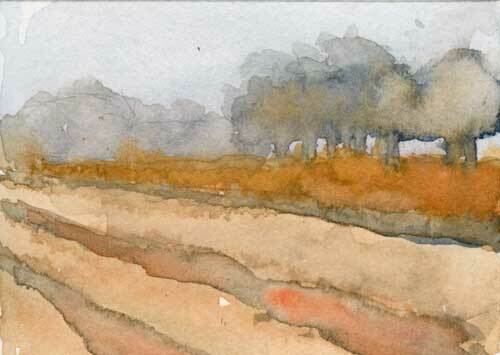 Problem is, the car is moving so fast through the landscape that all I capture are fleeting shapes and color. So rather than write a wordy blog post, dear reader, I give you some classic 5-7-5 haiku with my little sketches. Happy Tuesday afternoon! from town cloaked in trees. fast past a parked black-and-white. How to paint a tree? Edges, texture, size and form. 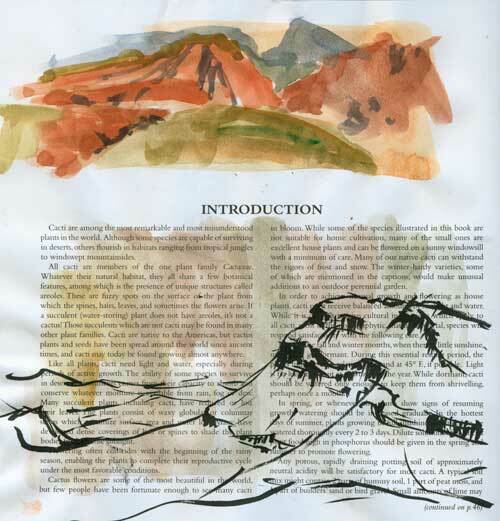 As I wrote yesterday, I lost my sketchbook while hiking and sketching in Red Rock Canyon Conservation Area in Nevada. I think I put it down either in the bathroom or the visitors center. Yes, I did ask at the lost and found. In fact, I filed a lost report with the administrative offices. Keep your eyes open; I really would like to have that sketchbook again. I admit, I was quite upset about losing this little book that was half-filled with good and bad sketches. 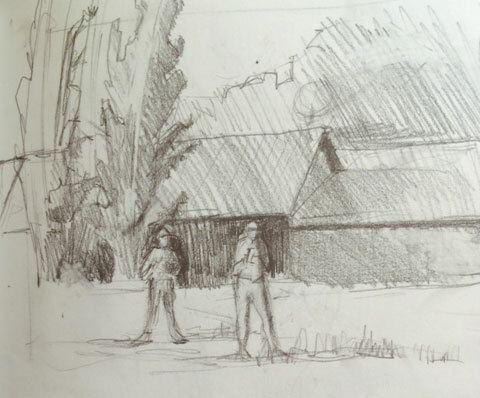 A sketchbook is intensely personal, although I don’t write a lot of personal stuff in it. 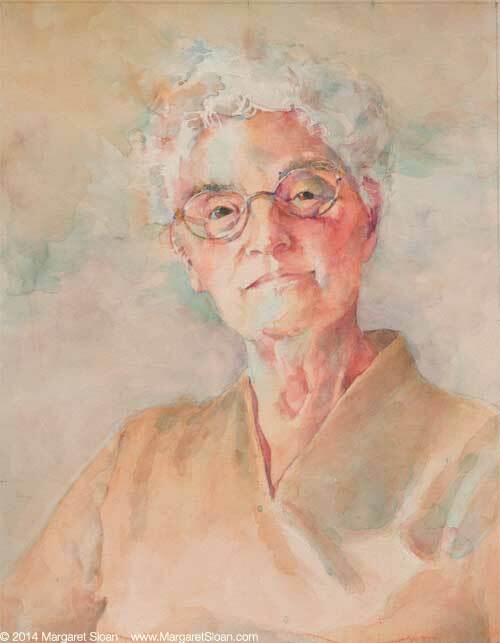 Still, it’s a record of my life—sketches I’d made at my granddaughter’s first birthday party; a painting of my mother; people I meet and places I go—as well as a place where I can work out ideas for projects. 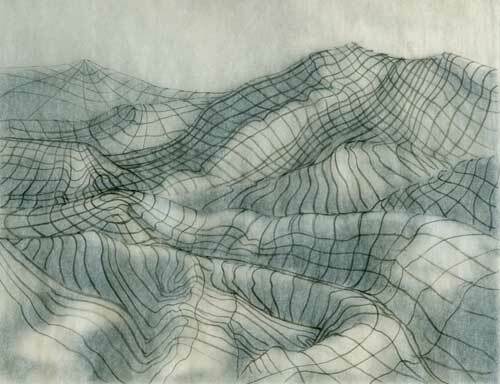 Besides, I was not there in the stinkin’ hot desert sweating like an old mule to hike (as was my friend, who is oh-just-slightly crazy), but to sketch. I was there to draw the beautiful rocks and mountains in that canyon, dammit. 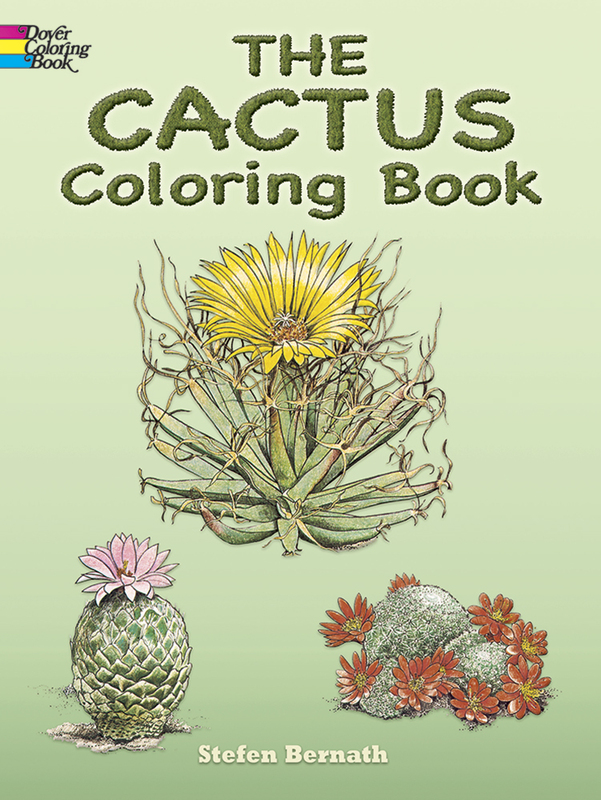 It’s a nice coloring book, with good information about cactus. There were some blank spaces. It didn’t have clay coated paper, so it would work (sort of) with watercolor. And it was inexpensive. While my friend courted heat exhaustion on the park trails, I collapsed in the shade of a gigantic rock and disgorged my painting kit. Painting in a coloring book was not the same satisfying experience as painting in my Stillman & Birn Zeta series sketchbook, but it was interesting to attempt to incorporate the artwork in the book into my paintings. I recorded some of the landscape. And it satisfied that awful craving to paint. Finally my friend crawled off the desert, having decided that it was too hot for even her lizard-lady blood, and we drove around in the air conditioned truck as the sun sank and the hills glowed in the heat. Sometimes I need to tear apart a subject and really understand what is going on with it before I can continue a project. 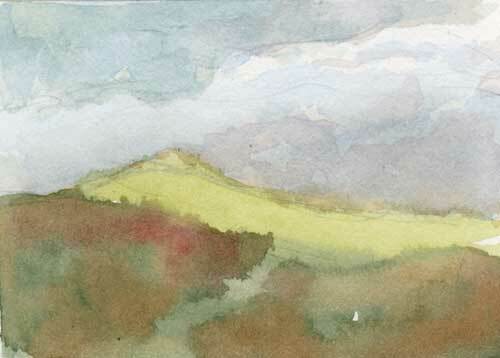 There’s a view near my home that I’ve been trying to paint, to no avail. I decided to strip it down to a simple charcoal study, which you see above, but before I could continue working on it, I needed to break it down even more. Then I added gouache for some color. I love that the paint can be applied transparently—you can still see the marks of charcoal under those glazes—but the pigment can also be slathered on and moved around like oils. 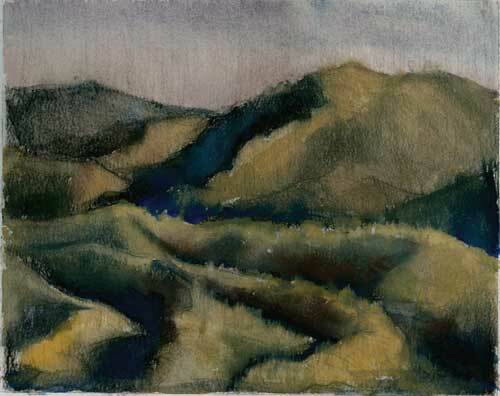 In fact, gouache seems to encompass characteristics of both watercolor and oils, depending on how much water you use. I’ve just begun using gouache, but I’m really liking it so far. This week I had to make a sojourn to the Bay Area. The fiddler likes to drive, so while the fiddler steered the infernal combustion machine, I painted. I love passenger-seat painting. Give me a wide enough view and a straight enough road (I suffer from motion sickness), and I can paint for miles. In the studio, it’s easy to get in that zone of hyper-focus where thought takes a backseat to conscious action. If you’re a painter, you know what I mean. Pick up some color with the brush, dab it on—ooo pretty—dab some more—ooo pretty pretty—dab, dab, dab—pretty pretty pretty—dab, no, wait, dang it, arggh! What have I done? If you don’t pause and move back, pretty soon you’ve created a muddy mess. 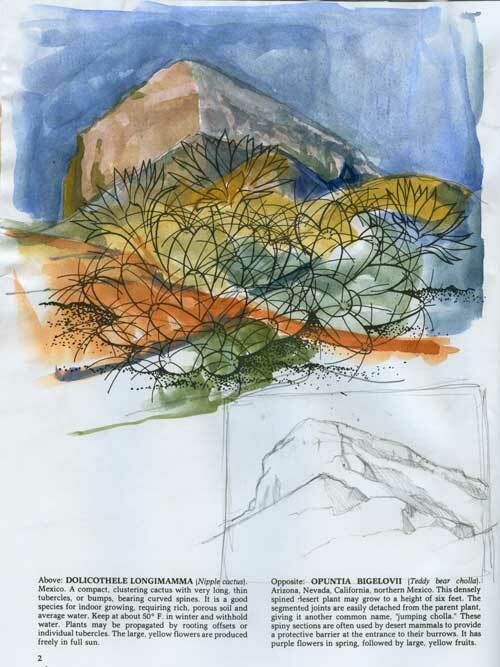 Painting landscape studies in the car (while someone else is driving—duh!) is a good way to break that kind of zen-zoned out paint daubing. You can’t focus for very long on one scene, because the scene changes minute-by-minute. So you have to make your decisions rapidly and correctly. 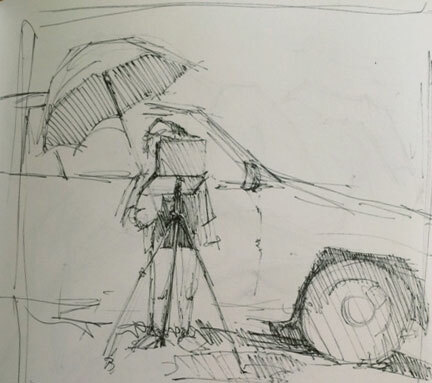 All you have time to do in the car is decide on a quick composition, draw the big shapes, get the right color and value on the palette, and paint the shapes. I start with the sky first usually, the brightest and lightest shape. The jiggling of the car prohibits any attention to detail; it’s all about composition, color and shape. I love these little watercolors. The challenge is to bring this freshness and life into larger studio paintings.